1. The Rehearsal Dinner – I want to see her wear something a bit more proper for this, so I really like this dress and jacket from Elie Saab…plus, it just looks beautiful! I also like the how the creamy grey color references her status as the bride, without being so spot-on obvious. 2. 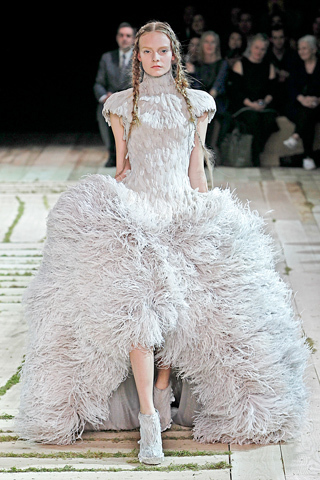 The Wedding – Ok, I know I am so predictable here and, apparently, completely in line with other fashion speculators, but I think Sarah Burton of Alexander McQueen should design the wedding gown. I’m not saying this gown, per se, but this gives an idea of how Burton can combine historical references in a dramatic and flattering way…modern, but still beautiful. 3. The Honeymoon – This Chanel gown seemed out-of-place with the rest of the Spring 2011 collection, but I think it would be perfect for the warm, relaxed evenings one has on their honeymoon. It’s glamorous, but in a casual-luxe sort of way, plus I love the colors.